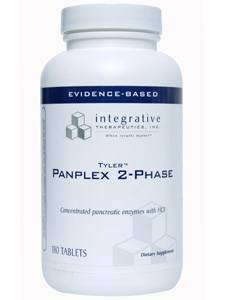 PanPlex 8® provides high potency 8X pancreatin (refers to the strength of the pancreatic enzyme complex). It is 8 times more potent than the minimum activity specified by the United States Pharmacopiea (USP), a standard for nutritional supplement and pharmaceutical laboratory methods. A digestive enzyme needed to digest protein, which is probably one of the most difficult substances to metabolize. Because of this, protease is considered to be one of the most important enzymes that we have. If the digestive process is incomplete, undigested protein can wind up in your circulatory system, as well as in other parts of your body & predispose you to increased food sensitivities. An enzyme that helps digest carbohydrates. Amylase is an enzyme that breaks starch down into sugar. Amylase is present in human saliva, where it begins the chemical process of digestion. Foods which contain much starch but little sugar, such as rice and potato, taste slightly sweet as they are chewed because amylase turns some of their starch into sugar in the mouth. The pancreas also makes amylase (alpha amylase) to break down dietary starch into di- and tri-saccharides which are converted by other enzymes to glucose to supply the body with energy. The proper absorption of fats is essential for absorption of the fat soluable vitamins A, E, D and K. This digestive enzyme is responsible for breaking down lipids (fats), in particular triglycerides, which are fatty substances in the body that come from fat in the diet. Once broken down into smaller components, triglycerides are more easily absorbed in the intestines. Supports the healthy break down of all major food types for enhanced digestive function. Enhances nutrient absorption and assimilation. Is clinically shown to improve stool consistency. Helps replace enzymes that naturally diminish with age. Is beneficial in supporting the body's natural anti-inflammatory response. Helps alleviate occasional pain associated with exercise and overuse of muscles. Which helps improve bile secretion thus helping to ease digestion. Assists in metabolizing cholesterol and fat. Facilitates absorption of vitamins K, A, D and E.
May help moderate cholesterol and triglycerides. May be beneficial in treating liver diseases such as cirrhosis and hepatitis. Is helpful to those who have had their gallbladder removed. By combining concentrated pancreatin with bile salts, in the form of ox bile extract, Panplex 8® offers enhanced digestive support for proteins, carbohydrates, and, in particular, fats. Research has shown that bile acids, such as ox bile extracts, can enhance the digestion and absorption of dietary fats in humans. Some research also suggests supplementation may enhance calcium absorption and improve stool consistency. DIRECTIONS: Take 1 or 2 tablets three times daily with meals or as directed by your healthcare practitioner. Do not chew. Not recommended if peptic ulcer, gastritis or heartburn is present. Other Ingredients: Dicalcium phosphate, stearic acid, hydroxypropyl cellulose, cottonseed oil, microcrystalline cellulose, calcium carbonate, magnesium stearate, and silicon dioxide. Contains No: milk, yeast, gluten or soy.